Richmond to Get First Custom Denim Boutique | News and Features | Style Weekly - Richmond, VA local news, arts, and events. 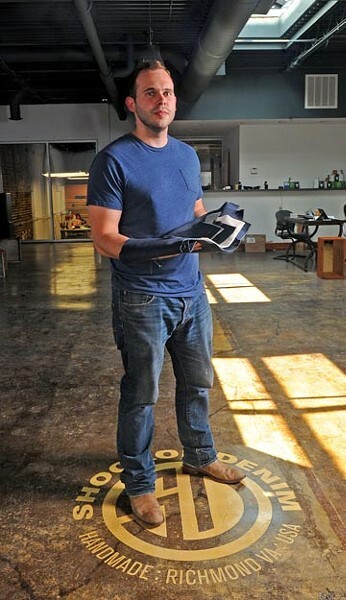 The 26-year-old Anthony Lupesco, holding cloth swatches, is preparing to open Shockoe Denim later this summer. Anthony Lupesco likes his jeans clean and his denim raw. Jeans should be modern, he believes. Simple. Unbejeweled, unembroidered, undistressed. The owner should put his or her impression on the jeans — not the other way around. Lupesco likes a Kentucky-made pair that's baked with beeswax, making them so stiff they retain the shape of the wearer's legs: "So it really becomes your product." Lupesco, 26, is preparing to open Shockoe Denim, the city's first custom denim boutique, on 15th Street in Shockoe Bottom. How custom? It's up to you. You can pick a pair off the rack and have them hemmed on the spot. You can have a pair made with your choice of fabric, wash and rivets. Or you can have a personalized pattern created for your nether half, which can be used to create bespoke jeans that fit you alone. Off the rack, Shockoe Denim jeans will sell for around $185 (in raw denim) up to $400 for specially treated pairs. The fabric comes from Cone Denim in North Carolina, which still uses old shuttle looms to make selvage denim — cloth with a self-finishing edge. The 2,800-square-foot space is sparsely furnished, aside from rolls of denim and the central cutting table. Industrial sewing machines are built to take the punishment of punching needles through denim. Lupesco's parents, Pierre Lupesco and Brigitte Odermath, are helping him run the manufacturing side of things. Lupesco has hired two employees and plans to add two more. Fashion is the family business. When Lupesco was a teenager, his father had a factory in Italy that manufactured high-end menswear. In 2006 Lupesco worked with his parents to open If boutique in Shockoe Slip. They moved the shop to Stony Point Fashion Park. But the decline of the dollar, the departure of Wachovia Securities and the sagging economy made it tough to buy and sell $1,500 European suits. "And then we closed," Lupesco says wryly. But the experience didn't discourage him. "Since it didn't work before," he says, "I want to redeem myself." And now he's controlling both sides of the business. "By creating a product in the U.S., I think we can make something better for a better price." Jeans aren't just weekend wear anymore, he says. They're the new blue blazer. And he likes the authenticity of denim, "that American spirit behind jeans — just rugged, honest work wear."